Whenever you have a few minutes to spare put away five or ten items that are not in their correct place. These could be toys that the kids have left somewhere, bills that need to be paid or filed, or socks that to be put in a drawer. Dump junk mail the moment you receive it. Deal with other mail at least once a week filing away what you need to keep in an indexed concertina file, card or plastic file wallets or even large brown envelopes. The five boxes method. This will clear clutter from any room or area of the house, but can look awful while in progress. Set aside a time when you won’t be disturbed, put on a tape of upbeat music and have a treat in the fridge for lunch. First job is to label the boxes –Rubbish, Give Away/Sell, Keep, Sentimental and Not Sure. You then go through everything in the area consigning each item to one of the boxes. Theoretically, by the time you have got rid of the Rubbish and Give Away/Sell boxes, you should have enough space to store the Sentimental and put the Keep items back in an orderly way. The Not Sure box should be sealed-up, stored in basement or attic and if not needed after six months or one year, given away unopened, so that you’re not tempted to keep the contents all over again. Be ruthless. If you haven’t used an item in the last two years you are not likely to need it again. Do you really want a clutter free, streamlined home or not? If you can’t face an entire room, break the job down into manageable tasks– the kitchen junk drawer, the letter pile, and the hats, coats and shoes area. That way you won’t be put off de-cluttering as just too big a task. Treat yourself to items that make staying tidy easier.Cardboard or see-through storage boxes are great for sewing and craft items, Christmas decorations, treasures that your children have made. Plastic or fabric hanging shoe bags are perfect for storing small toys and dolls or for hair brushes, clips, cosmetics and toiletries. Invest in some of those drawer dividers that separate drawers into a dozen little compartments – but don’t fill them with junk! Clean and pack 50% of your knick-knacks.Not only will this give your home a more modern minimalist look, you will get your dusting done in half the time. Consider enlisting the help of a family member or friend to be your organizing buddy. Hearing yourself try to explain why you need a whole kitchen cupboard full of plastic containers can help you get them into that Rubbish box. Be selective about what you buy. 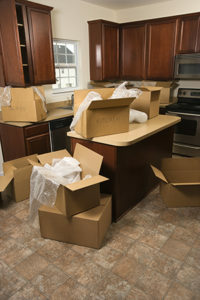 Stop and consider if you really need the item you are considering buying and where it will live? Some people work on a one in, one out system, i.e. if you buy a new sweater, toy for the children etc. then one goes to the charity shop or is given to a friend. This also goes for food and pantry items! Don’t give up. It will take time. All the clutter didn’t come into your home in one day and you won’t get rid of it all in one day. Keep on sorting, dumping, tidying and labeling, cut back on bringing new clutter home and it is a battle that can be won. You will have more time, a neat home and less stress as a reward for your efforts.